There are a number of events that make up each competition. The events used in each individual contest vary in order to prevent favoring certain types of competitor. Loading Race – Five heavy objects weighing between 220–360 lbs (100-164 kgs) are loaded onto a truck bed or a similar platform over a course of about 50 ft.
McGlashen Stones /Atlas Stones – Five heavy round stones increasing in weight from 220–352 lbs (100-160 kgs) are placed on top of high platforms. The course tends to be about 16–33 ft. long and has seen three variations- five stones placed directly in front of platforms, five stones placed away from platforms and competitors carrying them to platforms, and platforms arranged in a straight vertical line with a stone in front of each. In recent competitions this is typically the final event. Truck /Airplane Pull – Vehicles such as transport trucks, trams, boxcars, buses or planes are pulled across a 100 ft course by hand as fast as possible. Also, the vehicles may be pulled with a harness around the shoulders. Overhead Press – The heaviest possible load is pressed overhead, or a lighter weight is used for repetitions. Fingal Fingers – A series of progressively heavier, hinged poles (“fingers”) are lifted starting from a horizontal resting position and flipped over to the other side. The event takes its name from Fingal, a mythological Gaelic hunter-warrior. Power Stairs – A series of three Duck Walk implements ranging from 400–600 lbs (182-273 kgs) are lifted, step by step, to the top of a flight of stairs. Squat – Squatting large weights, like 900 lb (409 kgs) of bricks, a car, or people on a platform. Recently, an apparatus has been used that drops weighted kegs into a cage, one at a time after each successful lift (the event in this case is scored by weight instead of repetitions). The athlete will continue until completion, failure or time expires. Dead Lift – Lifting weights or vehicles up to about 1,100 lb (500 kgs) straight off the ground until knees lock in a standing position. Lift is for either maximum weight, maximum repetitions with a fixed weight, or for time whilst holding a single repetition. In recent years, a similar keg-loaded apparatus to that described above for the squat has been used. 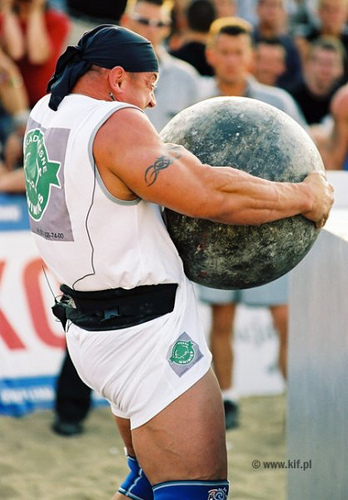 Keg Toss – Competitors must throw kegs, of increasing weight, over a 14 ft 6 in (4.42 m) high steel wall. Car Carry – Standing inside a roof-less, bottom-less car supported by a harness, competitors must carry the car for the maximum distance or shortest time for 25 meters. Hercules Hold – The athlete stands between two hinged pillars, gripping handles that prevent the pillars from falling to the side. The pillars are held for the longest possible time. Carry and Drag – Two weights are carried to the end of a set distance. An anchor and chain must then be dragged back the same distance. 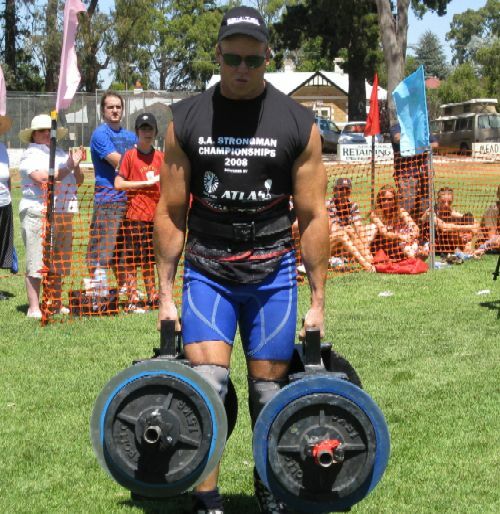 Farmer’s Walk – Competitors carry heavy objects weighing from 275-375 lbs (125- 170 kgs) in each hand for a set distance, and compete for the fastest time. A variation involves use of a heavy frame with parallel handles. Yoke Walk / Fridge Carry – A yoke, composed of a crossbar and two weighted uprights (normally fridges) weighing about 904 lb is carried across the shoulders for a set distance. Husafell Stone – A flat, somewhat triangular rock weighing around 400 lb (182 kgs) is carried high on the chest for a set distance. During the three years in which the competition took place in Africa, this event was known as the Africa Stone. Duck Walk – A 400 lb (182 kgs) pot with a handle is carried, suspended between the legs, over a set course. Log Throw / Caber Toss – A five meter long log is thrown for distance or for height over a bar. Tug of War – One on one tug of war in a single-elimination tournament. Pole Pushing – One on one pole pushing in a Sumo-style ring in a single-elimination tournament. The pole has handles at either end. IF YOU TAKE THIS LEG EXTENSION MACHINE, WRAP A CHAIN AROUND IT, AND DRAG IT AROUND THE PARKING LOT, YOU’LL GET A HELL OF A LEG WORKOUT. Hudo produkcijo ma tale pacificstrong.